Are you looking to add some special memories to your party? What better way to display these precious memories using our Digital Memories Package! Imagine your guests appearing on television with live footage and candid photos appearing in a slideshow on our TV screens. Any Grand Entrance, Special Dance, Toast, or Speech will be displayed on the TV’s with your guests having a front row seat! Capture the hearts of your guests by displaying a photo montage taking them through the guest of honor’s life through photos and music! We combine 20 photos of the bride’s life, 20 photos of the groom’s life and 20 photos of the bride and grooms life together. Pictures are scanned and digitally enhanced. 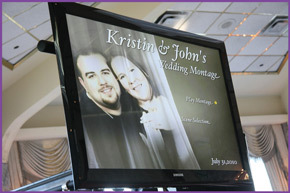 A montage is created using the photos and 3 songs that the couple chooses. The montage is displayed during dinner at the reception. Photos are displayed throughout the night on the TV(s). 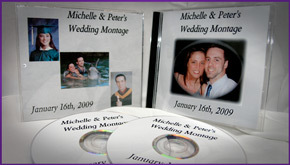 Photos are burned to a CD and given to the newlyweds at the end of the celebration. Within 24-48 hours, your photos will be posted on our website for guests to download and leave comments. The gallery is password protected (we’ll provide the password to your guests the night of the event) and stays up for 1 full year!